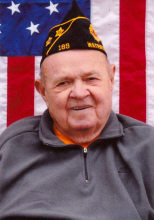 Donald (Donny) J. Cayan, age 93 of Watertown, passed away after a happy morning reminiscing with family on Saturday, November 24, 2018. Don was born on May 5, 1925 in Fond du Lac to William and Mamie Checki. On September 9, 1925, he was adopted by James and Clara Cayan of Watertown. Two months after discharge from the Army, he married the love of his life, Marion Miller, on June 15, 1946 at St. Henry’s Church. Together, they raised six daughters; Carol (Vern) Schumann, Susan (Robert) Wurtz, Linda Cayan, Donna (Brad) Kerbel, Gail (Richard) Rothenbueler, and Mary Cayan. Don was employed for several years at GB Lewis, Johannsen’s Greenhouse and retired from his favorite job with the Watertown School System. He was an active member of the Watertown Senior Center for several years and served as a board member. Don was also an active member of St. Henry’s Catholic Church and the Catholic Knights. He is survived by his daughters, son-in-laws, 9 grandchildren, 16 great grandchildren, numerous nieces, nephew and many other relatives and friends. He was the last member of his immediate family, preceded in death by his wife Marion, his brother, sisters and in-laws. The family would like to express sincere love and gratitude to the Meidl and Strese families for their loving care in his final years. A visitation is planned for Friday, November 30, 2018, from 9:00-11:00 A.M. at St. Henry’s Catholic Church, with a Mass of Christian Burial at 11:00 A.M., officiated by Reverend Patrick Wendler. Burial will follow at St. Henry’s Cemetery with presentation of Military Honor Guard. Schmutzler-Vick Funeral Home & Cremation Service is serving the family. Remembrances and condolences may be sent on www.watertownfuneralhome.com. To send flowers or a remembrance gift to the family of Donald J. Cayan, please visit our Tribute Store. "Email Address" would like to share the life celebration of Donald J. Cayan. Click on the "link" to go to share a favorite memory or leave a condolence message for the family.